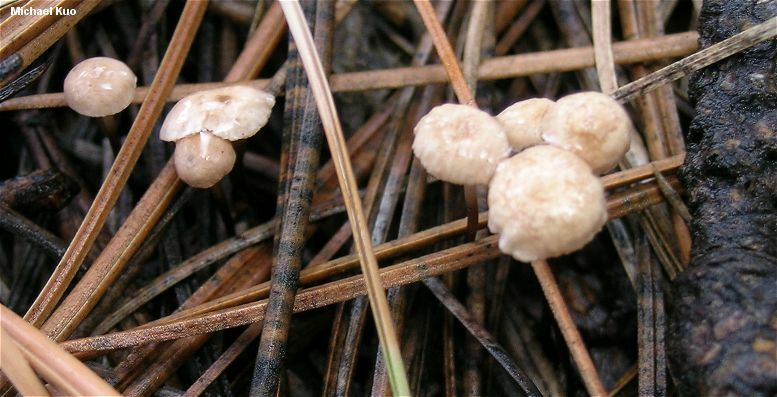 Yet another tiny marasmioid mushroom with a whitish to brownish cap, Micromphale perforans distinguishes itself by arising from the fallen needles of conifers (usually needles of spruces; sometimes those of pines). It also smells bad. Not garlicky or oniony, like some of its marasmioid brethren, but foul and reminiscent of rotten cabbage. Microscopic features--which should be checked for positive identification--include inamyloid, ellipsoid to pip-shaped spores, a lack of notable cystidia, and a pileipellis arranged as a cutis of elements with slightly incrusted walls. 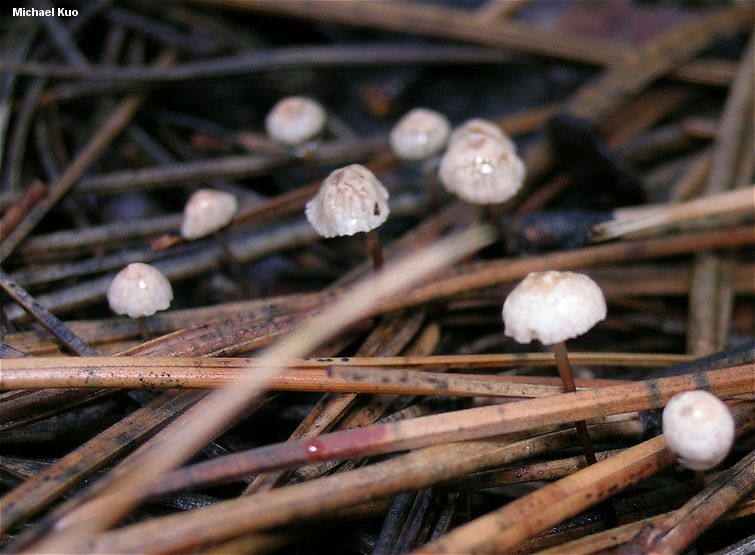 The name of this fungus should probably be Gymnopus perforans; Noordeloos & Antonin (2008) have made an official combination into Gymnopus in anticipation of a revised monograph of marasmioid and collybioid mushrooms in Europe which, to my knowledge, has not yet been released. Ecology: Saprobic; arising from the fallen needles of spruces, firs and, less often, pines; growing scattered or gregariously; summer and fall; widely distributed in North America. Cap: 4-17 mm across; convex, becoming broadly convex or broadly bell-shaped but often developing a central depression and/or bump; dry; bald; sometimes becoming slightly wrinkled or ribbed; pale brown when very young but often fading to buff or nearly white. 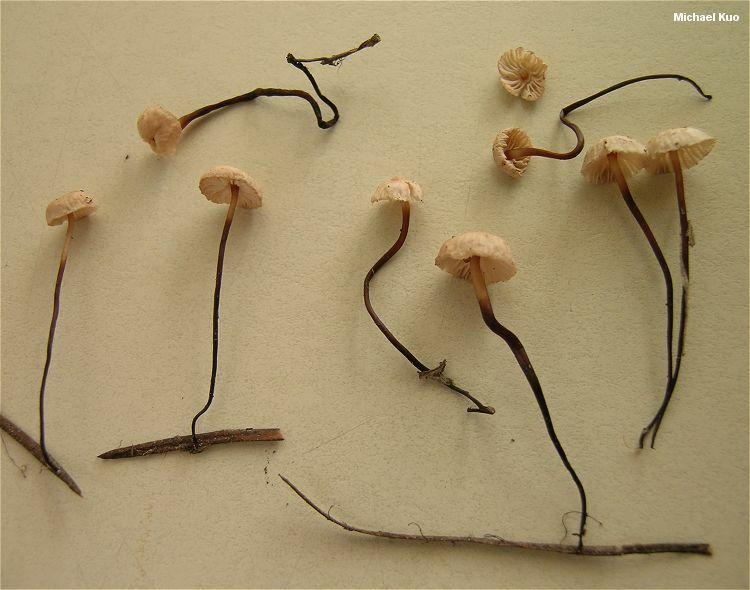 Gills: Narrowly or broadly attached to the stem--or occasionally attached by means of a "collar" that encircles the stem; distant or nearly so; buff to whitish. Stem: Up to 40 mm long; 0.5-1 mm thick; equal; dry; finely hairy to finely velvety (more so toward the base); pale at the apex, but brown to dark brown, reddish brown, or nearly black below. Flesh: Thin; insubstantial; whitish to brownish. Odor and Taste: Odor usually unpleasant (reminiscent of rotten cabbage) but sometimes faint or lacking; taste similar, or not distinctive. 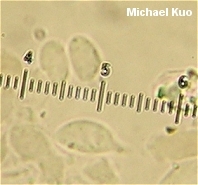 Microscopic Features: Spores 6-9.5 x 3.5-5 µ; smooth; pip-shaped or ellipsoid; inamyloid. Pleuro- and cheilocystidia absent--or if present basidiole-like, inconspicuous, and not projecting. 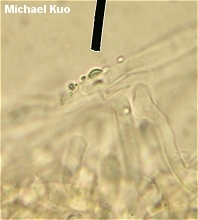 Pileipellis a cutis of hyaline to brownish hyphae 3-6 µ wide, with occasionally encrusted walls; sometimes partially gelatinized. REFERENCES: (Hoffmann, 1789) Gray, 1821. (Fries, 1821; Saccardo, 1887; Breitenbach & Kränzlin, 1991; Noordeloos, 1995; Knudsen & Vesterholt, 2008; Trudell & Ammirati, 2009.) Herb. Kuo 08051001.